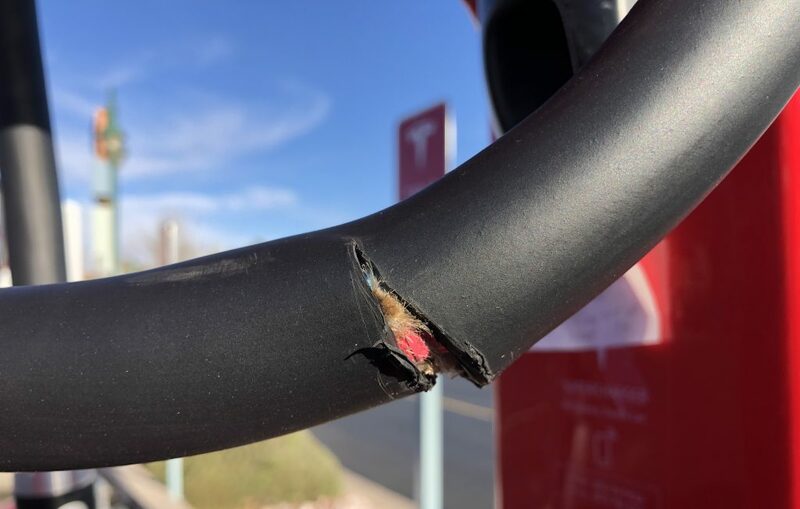 ST. GEORGE — Tesla owners stopping in St. George for a quick recharge recently had a rude awakening at the Supercharger station on Bluff Street, finding the charging stations extensively damaged in an apparent act of vandalism. “All the stations were vandalized,” Ivins resident Mark Larsen told St. George News. Larsen is a Tesla Model 3 owner who was among the first to report the damage Jan. 25. 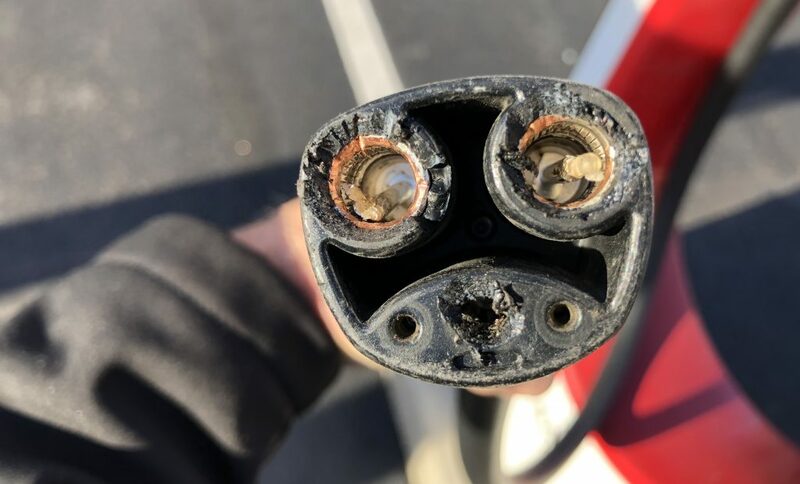 Larsen described how whoever was responsible for the vandalism to the station on 1091 N. Bluff Street attempted to cut the charging cables and apparently drilled into the connector prongs in each plug, rendering several of the stations completely inoperable. While Tesla had the damage repaired within a matter of three days, the vandalism was extensive enough to have the effect of stopping owners of the popular electric cars in need of a quick recharge dead in their tracks. The Bluff Street station is the only one of its kind in southwest Utah past Beaver, providing point-to-point recharging for motorists on major routes in all directions, whether they’re heading north from Las Vegas, west from Page, Arizona, or south from central Utah. The only other alternative charging locations are various “Destination” stations at hotels around town, taking about 5 ½ hours to charge a range of 200 miles, which the Supercharger station can provide in 30 minutes. Tesla reported the damage to St. George Police Jan. 28, estimating the cost of repairs to be $8,000. The officer investigating the case wrote in a statement that seven of the station’s eight charging cables had been damaged beyond repair. The officer also found additional vandalism in the area of the crime scene, describing in the statement how six architectural flood lights were smashed and a flagpole flying the U.S. flag was damaged. Within less than 24 hours of starting the investigation, the officer found a man who allegedly admitted to the vandalism. On the night of the apparent vandalism, 52-year-old Johnny Doak had been told to leave the nearby Switchpoint Community Resource Center after he allegedly repeatedly trespassed on the property in the early morning hours. Doak was arrested on a trespassing violation later that day and booked into jail at Purgatory Correctional Facility in Hurricane. The investigating officer spoke to a witness who said Doak had been bragging about damaging property in the area of the Supercharger station. 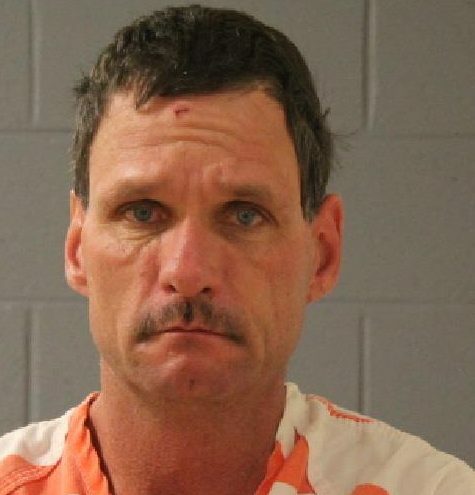 When the officer met with Doak at the jail, he admitted to causing the damage, describing how he had been drinking heavily that night and was grieving the death of a family member, according to the police statement. Doak was charged with a single count of second-degree felony criminal mischief involving damage of more than $5,000. He remains in custody on $10,000 bond and is scheduled for arraignment on Monday.